Ride sharing is widely considered to be a significant part of the future of transportation. The key difference between companies like Uber and traditional public transportation is that so far, Uber operates more like a taxi, picking up and dropping off individuals exactly where they need to be. However, Uber loves to try new things, and to push traditional boundaries – UberHOP is doing exactly that. UberHOP is a new option from Uber that uses larger vehicles to allow multiple riders to be picked up at a shared starting point and dropped off at a common destination. UberHop will launch on Tuesday, December 15th as a pilot in Toronto, operating along four different routes in the downtown core. Throughout its first week of operation, UberHOP is set to be completely free, but will eventually shift to a $5 fare. An update to Uber’s mobile app will enable UberHOP functionality in the app, allowing riders to select a pickup point and departure time. 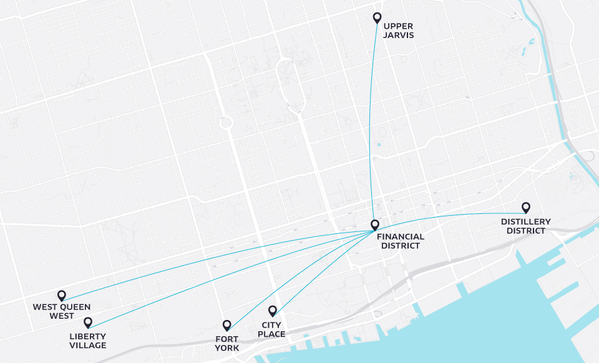 Over the course of its pilot project, routes are confined to the Financial District in Toronto. However, users have the ability to request new routes at this link as well. UberHOP pilot routes will be operate inside the Financial District between 7-10 AM, and back to CityPlace, Fort York, Liberty Village, and the Distillery District between 4:30-7:30 PM, only on weekdays. This new pilot program won’t offer nearly as much flexibility or precision as Uber, but the flat rate will surely be worth it for regular Uber users or commuters looking for a more affordable method of transportation. Update – January 11th, 2016: Uber has expanded the UberHOP pilot to two new Toronto locations. Those surrounding the Queen West and Upper Jarvis area can now user the service to head into the Financial District.